Come along with us to explore an important place in Church history! If Maggie and Lily E. want to see where the Church was first organized, they don’t have to look very far. It’s right next door to the chapel in Fayette, New York, where they go to church every Sunday! The Church wasn’t organized in a church building, but in a log house. The Prophet Joseph Smith had come to stay there with the Whitmer family in 1829. The original house no longer stands, but this log cabin is on the same spot. The church building where Maggie and Lily go to church has a visitors’ center with displays about the Whitmer home and the special things that happened there. 1. Joseph Smith finished translating the Book of Mormon here. 2. Outside, not far from the house, three men saw the angel Moroni and the gold plates. They are called the Three Witnesses because they witnessed, or saw, the plates. You can find their testimonies in the front of the Book of Mormon. 3. On April 6, 1830, about 60 people came to a special meeting. 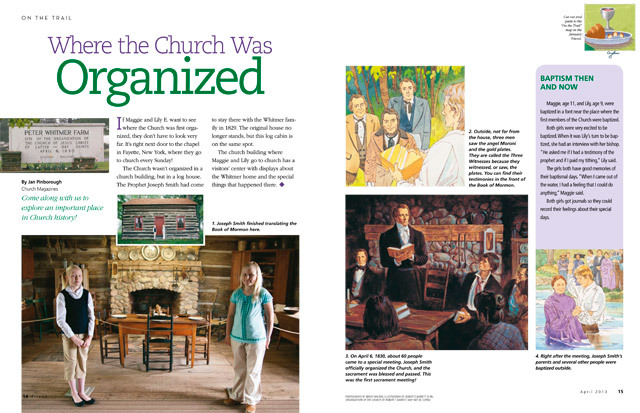 Joseph Smith officially organized the Church, and the sacrament was blessed and passed. This was the first sacrament meeting! 4. Right after the meeting, Joseph Smith’s parents and several other people were baptized outside. Maggie, 11, and Lily, 9, were baptized in a font near the place where the first members of the Church were baptized. Both girls were very excited to be baptized. When it was Lily’s turn to be baptized, she had an interview with her bishop. “He asked me if I had a testimony of the prophet and if I paid my tithing,” Lily said. The girls both have good memories of their baptismal days. “When I came out of the water, I had a feeling that I could do anything,” Maggie said. Both girls got journals so they could record their feelings about their special days.